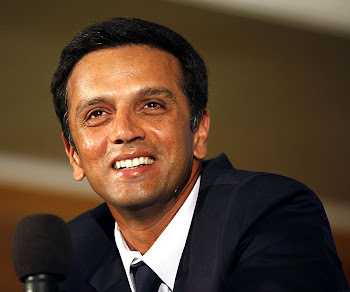 Rahul Dravid, who was a patient onlooker at the other end as Virender Sehwag blazed his way to the fastest triple-century in Test history, termed the feat a "really audacious knock". "It was phenomenal, simply exceptional batting," he told Cricinfo at the end of a frenzied third day during which Sehwag knocked off records. "The range of shots that he played was terrific. He was in the zone, played 360 degrees. "Of course it was a flat wicket, slightly on the slower side but he was creative. Standing at the other end it was almost like watching a highlights package." Dravid himself made a slow start but it mattered not a jot with Sehwag going berserk, breezing through the 190s and then cruising to his second triple. "It's definitely not easy to be at the other end, almost as if you're asking when do I get to have some fun," he said with a laugh. "But I've batted all my life with people like this around me. I work on the basis of partnerships going well. It was just a matter of pushing him and egging him on. It was probably similar to the innings in Multan. That pitch probably had a bit more in it and it wasn't as hot there. But when he gets into the zone he's an incredible batsman." Ramiz Raja, who watched Sehwag's maiden triple in Multan, said the encore was a privilege. "It's tough to compare the two innings but both had great improvisation from Sehwag," he told Cricinfo. "He made it look so easy. The great part about him is he doesn't bother about milestones and simply plays his shots. He's shown unbelievable control here, shots all around the wicket. It's up there with some of the best." Mickey Arthur, South Africa's coach, couldn't believe what he saw. "I think that's the best Test-match innings I've ever seen," he said. "The way he played today was absolutely amazing. We tried to attack him, we defended against him, tried to bowl straight lines, bowl wide, over the wicket, round the wicket, did everything possible. And he countered us."